Food Dignity is an inter- and postdisciplinary action research project designed to support five communities’ efforts to build sustainable food systems, tell their stories, and create common ground between the collaborating campuses and communities. 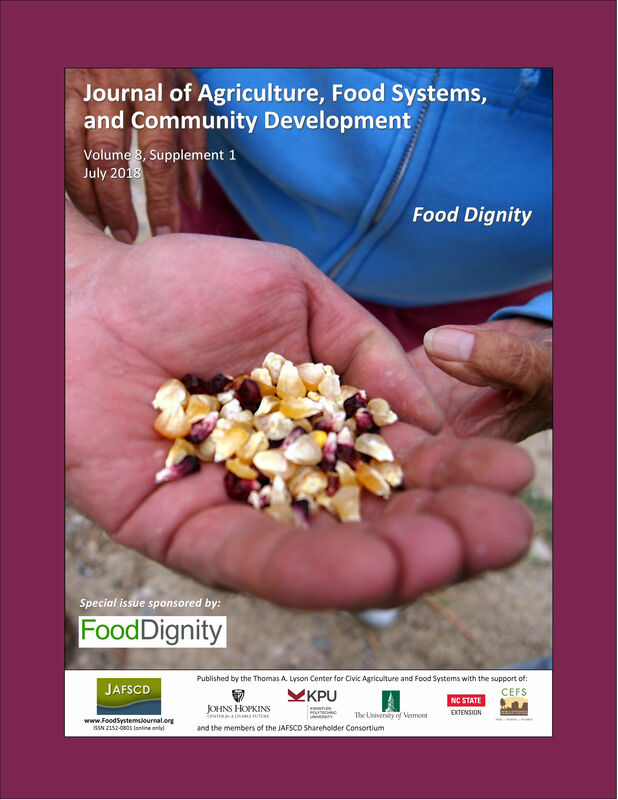 Food Dignity graduate students were intermediaries between more senior academic part­ners and community partners. This paper high­lights graduate students’ encounters with academic supremacy, which refers to systemic inequalities and the material, ideological, and practical privi­leges afforded to forms of academic knowledge production. We build on Porter and Wechsler’s (2018) explanation of academic suprem­acy, which they define in another article in this issue, in order to highlight certain aspects that relate specifically to the graduate student experi­ence. Using autoethnography, we describe the institutional ties, emotional experiences, relation­ships, and values that defined our intermediary status. This status and the support of community partners allowed us to explore ways in which aca­demic supremacy influenced our work and strate­gies for dismantling academic supremacy. We detail the conflicting pressures from academic institu­tions and community partners and the role of social justice values in balancing these pressures; we review how academic researchers deal with difficult social problems in the research process and the potential to use emotion as a guide through these difficulties; finally, we posit praxis-from-the-heart as a strategy for using emotions rigorously and productively to combat academic supremacy. Ph.D. student, University of California, Davis. Katharine is now an unaffiliated scholar based in New York. Megan is now at North Carolina Cooperative Extension, Forsyth County Center. Masters student, University of Wyoming. Melvin is now a research scientist for the University of Wyoming who lives and works on the Growing Resilience project in the Wind River Indian Reservation.